Ignacio has been working with his tutor, Jim, since January 2014, and both have seen significant improvements not only in Ignacio’s reading and speaking abilities but also his confidence. Ignacio recently had his review at work in the Spring of 2015, and he said that it went very well and that he will be getting a raise! He attributes it to working hard and being a dependable employee. He also said that he feels much more comfortable at work than he did in the past because he is better able to communicate with his supervisor now. According to Jim, in the last year, Ignacio has also become more engaged with his three daughters school activities, i.e., parent teacher conferences where he is more comfortable about being there, because now his daughters do not have to serve as translators between him and their teachers. Also, during his daughters’ soccer season, he is more comfortable socializing with the other parents. Before, he said he would just drop them off and leave because he felt intimidated since he didn’t feel he could communicate well enough with the other parents. With Jim’s help through Whatcom Literacy Council, Ignacio’s hard work and dedication to improving his English skills are paying off at his job and in all aspects of life. Cindy and Lupita have been working toward the goal of Lupita becoming more involved in the community. Lupita decided she wanted to teach Tai Chi and she set a goal to be able to express herself in English (her second language) as a Tai Chi instructor. Lupita recently began offering free classes in Tai Chi at the Deming Library. She teaches a children’s class and an adult class which are both well attended. Cindy is actually one of her students and says she’s doing an absolutely beautiful job! Kate and Veerpal started meeting in August of 2009. They have been working for over a year to support Veerpal’s work from her Whatcom Community College English as a Second Language (ESL) classes, as well as building general conversation and writing skills. They’ve used a wide range of materials, such as nursing books, word puzzles, recipes, songs, poems, stories and computers during their sessions. 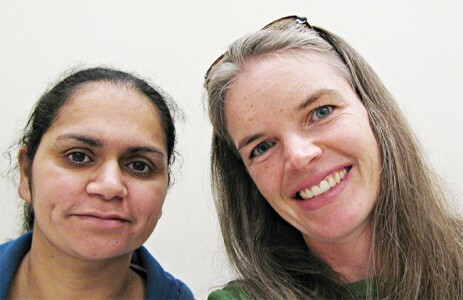 Veerpal recently met her goal of exiting ESL classes at Whatcom Community College. This means she was able to pass an exit exam that showed proficiency as an advanced student in listening, speaking, reading and writing. Congratulations to Kate and Veerpal!